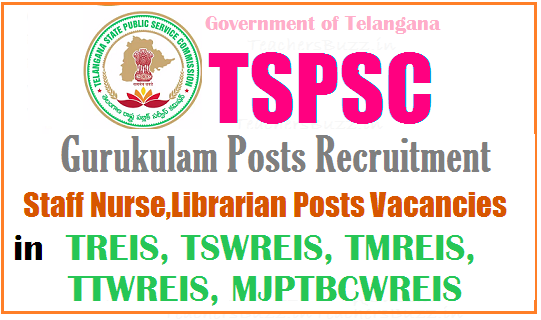 TSPSC Gurukulam Staff Nurse,Librarian Posts Vacancies in TREIS, TSWREIS, TMREIS, TTWREIS, MJPTBCWREIS Recruitment 2017. TSPSC gurukul recruitment notification 2017, TSPSC Recruitment Staff Nurse,Librarian Posts vacancies in Telangana gurukulams, Category wise Staff Nurse,Librarian Posts vacancies for TSPSC Gurukulams Recruitment 2017, TSPSC gurukul teachers recruitment, gurukulam wise , category Staff Nurse,Librarian Posts vacancies for TSPSC Telangana REI Societies Recruitment, Subject wise PET, PD posts vacancies for TSPSC TS Residential Schools Recruitment, TSPSC Gurukulam Staff Nurse,Librarian Posts 2017. Staff Nurse,Librarian Posts vacancies details are given here. Government of Telangana has decided to Direct Recruit the vacancy position in all Residential Educational Institutions Societies through TSPSC. Telangana State Public Service Commission has issued notification to fill 7,306 vacancies under Residential Educational Institutions Societies (REIS) on its official website. The online application process for the exam starts on February 10 and will end on March 4, 2017. The examination is being conducted to select 4,362 Trained Graduate Teachers (TGT), 921 Post Graduate (PG) Teachers (PGTs), 6 Physical Director (School), 616 Physical Education Teachers (PETs), 372 Art Teachers, 43 Craft Teachers, 197 Music Teachers, 533 Staff Nurses and 256 Librarian (schools). Staff nurse Examination likely to be held on April 2, 2017. Librarian (school) the examination (objective type) is likely to be held on April 16, 2017.The commission reserves the right to conduct the examination either Computer Based Recruitment Test (CBRT) or Offline OMR based examination of objective type. IMPORTANT NOTE: The number of vacancies are subject to variation on intimation being received from the appointing authority.